When the NASCAR Sprint Cup Series last visited Auto Club Speedway in 2013, the final lap was one full of drama, excitement and the culmination of a brewing feud. 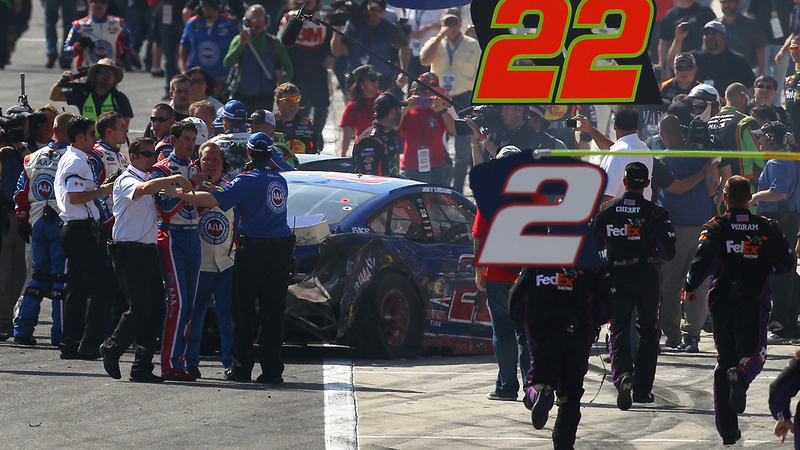 One week earlier, former teammates Denny Hamlin and Joey Logano tangled on the high banks of Bristol Motor Speedway. Racing at the front of the field, Hamlin’s No. 11 Toyota got into the back of Logano’s No. 22 Ford, sending him into the outside wall and ruining a promising day. Logano responded after the race by confronting Hamlin and his Joe Gibbs Racing team in the Bristol garage. The two drivers saw the Bristol incident, and its repercussions, a bit differently. Hamlin felt the so-called feud was behind them, while Logano was still waiting for an apology one week later. Fast-forward to the closing laps of the following week’s race in Fontana, and it was Logano and Hamlin battling once again. This time, however, it was for the win. 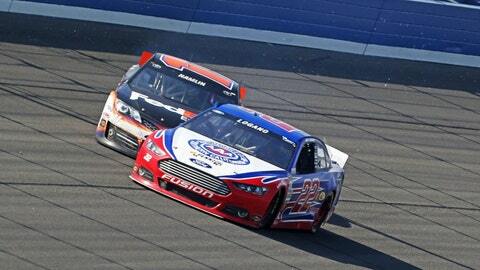 With Logano out front and Hamlin in hot pursuit, there was no letting up for either driver around the 2-mile speedway. Driving to the apron, throwing blocks and making contact multiple times, the pair raced side-by-side on the final lap. In the final corner, Logano bobbled on the bottom lane and drifted into the side of Hamlin’s car. As Kyle Busch screamed past both cars on the high side for the win, neither Hamlin nor Logano were about to give an inch. Making more contact in Turn 4, Hamlin sent Logano into the outside wall as his No. 11 shot to the inside of the track. Making hard contact with the inside wall, Hamlin’s day – and, ultimately, his season – came to an abrupt end. The section of wall Hamlin hit head-on was not protected with a SAFER barrier, which resulted in a fractured vertebra, and forced Hamlin to sit on the sidelines for the next four races. What this incident revealed – aside from the need for more SAFER barriers – is that the two former teammates were not as close as previously imagined. The on-track feud between Hamlin and Logano essentially ended after the Fontana race, but in the garage and in the motor home lot things remained tense between the two camps. This weekend, the series returns to Auto Club Speedway, and neither Hamlin nor Logano are focused on last year’s incident. Instead, both are focused on securing their first win of the season, and securing a better result than last year. Yet with NASCAR’s new Chase format, if the pair was to find themselves racing for the win once again, don’t expect either driver to give an inch.